When working with HapYak's slidesync experience, it's possible to add on-time effects to the playlist, slider, or to the slides themselves. Read on to find out how! You can use the on-time annotation to skip to a specific slide at a certain time in the video. Add an On-Time event at the moment where you want to skip to a new video. In the toolbar, this looks like a stopwatch. In the 'Addon Type' field, type 'slidesync.' 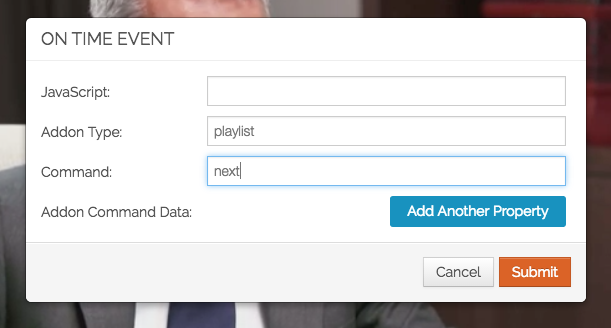 In the 'Command' field, type 'next', to go to the next slide in the playlist, or 'previous', to go to the previous video. You can also go to a specific slide in your deck. In the command field, type 'goTo.' Then, click 'Add Another Property.' 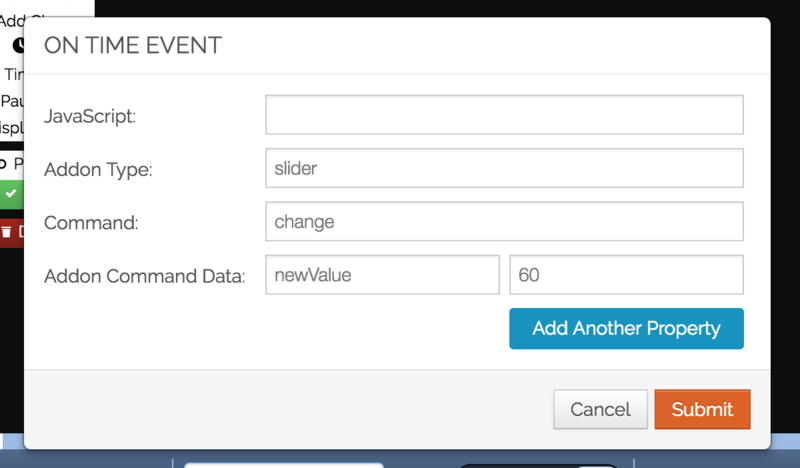 In the fields that pop up, type 'value', and then the number of the slide that you want to skip to. You can skip to a different video in your slidesync playlist at a certain time. To do so, add an On-Time event at the moment where you want to skip to a new video. In the Addon Type field, type 'playlist'. In the Command field, type 'next', to go to the next video in the playlist, or 'previous', to go to the previous video. 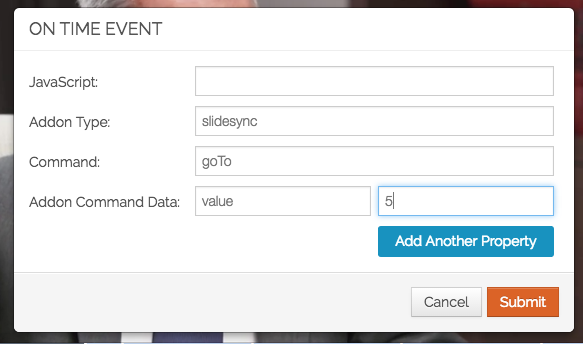 You can automatically set where your slider starts when you open a slidesync project. Add an on-time annotation to the beginning of your video. In the Addon Type field, type 'slider.' In the Command field, type 'change'. Then click Add new property. In Addon Command Data, type 'newValue', and then the value from 0-100 that represents how far to the left or right you want the slider positioned. A value of 100 will push it all the way to the right of the screen.